Sometimes the simplest things are the best. And after all of those holiday meals and endless temptations, what could be better than the incredible lightness of Chocolate Mousse? I’m a texture freak. When I think about producing a pastry, the sensation of texture is always a very important element. Mousse has the lovely property of being so light and ethereal, which makes it a great way to show off the intensity of the central flavor. So I was more than gratified to discover that that my search for the perfect Chocolate Mousse has ended with revered Parisian pastry chef, Pierre Hermé. Since Hermé is best known for his complex multi-layered flavor extravaganzas with a distinctly modern flair for design, it was a bit of a surprise to encounter this simplest of concoctions among his collections. While I’ve enjoyed executing his recipes, I sometimes find them far too rich and heavy for my palate. I always look for ways to use his ideas and assemblies in much lighter form. I’m beyond blissed to taste such a terrific version of an old French standard. 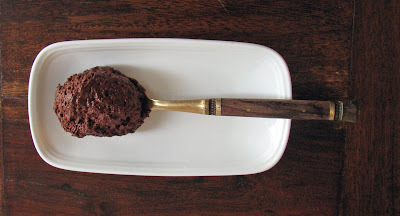 This mousse is neither too light, too fluffy or inconsequential nor too dense, heavy or cloying. The texture comes not from the addition of the usual whipped cream, but rather from a billow of egg whites. This means that as it settles on your palate, there is no extra fat to interfere with the essence of chocolate, leaving a very clean aftertaste. Hermé reveals the wonders of mousse and reminds me that it is one of my favorite mediums. This dessert is all about the chocolate, so please splurge for highest quality. My recommendations for chocolate that you can likely source in places like good chocolate retailers or Whole Foods are Valrhona Manjari 67% (bright, bold and fruity) or El Rey Gran Saman 70% (earthy, fruity with a hint of citrus and nutmeg) or your very own favorite high quality bar. If you can get your hands on a Cluizel Maralumi 64% semi-sweet, do it! Reach for that peak experience. I promise you will not regret it. 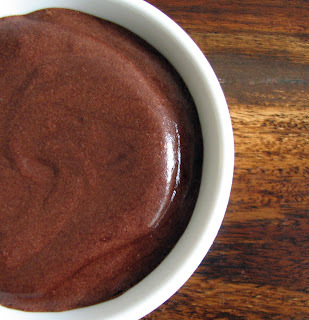 - If you’re not a huge fan of dark chocolate, you can of course use semi-sweet (reduce the sugar in the recipe) or a half-way-there of 3 oz of bittersweet and 3 oz of semi-sweet. - Resist the temptation to garnish. It would be gilding the lily! OK, I did once plate this with a few fresh blackberries that had been spritzed with a bit of crème de cassis and it did elicit extreme moans of pleasure from a chef who said he wasn’t that partial to mousse, but that’s it! If you insist on a spot of whipped cream, make it a very, very little dollop. - Hermé does suggest some additional flavorings if you’d like to change it up: grated orange zest infused in the milk or a spoonful of instant espresso powder, a shake of ground cinnamon or cardamom. - As always, exercise caution when using raw egg whites. They should not be served to small children, pregnant women or individuals who are at risk due to compromised immune systems. Chop chocolate into small pieces and place in a bowl large enough to contain all of the ingredients and accommodate the folding process. Place the bowl over a bain marie or a simmering water bath. Make sure the bowl is not touching the water and the water is kept to a low simmer. Take off the heat when the chocolate is melted. Gently bring the milk to a boil. Pour over the melted chocolate and slowly whisk. Add the egg yolk and whisk until fully incorporated. Whip eggs whites on medium speed until they reach a soft peak. Increase to medium high and gradually add sugar in a slow steady stream until egg whites are firm and glossy. The chocolate mixture should be cooled by the time the egg whites are ready. Add 1/3 of whites to chocolate mixture and gently whisk to combine and lighten the chocolate mixture. Switch to a large rubber spatula and gently fold in remaining 2/3 egg whites until there are no streaks. Pour into individual servings or a large bowl. Chill for about 1 hour. 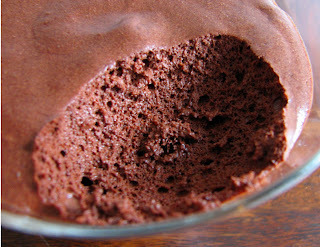 The texture of this mousse is lighter if served after the brief chilling. However, you can cover and store in the refrigerator up to 2 days. The texture will be much more dense. I just love the texture of a good fresh mousse. That picture looks like my idea of chocolate mousse heaven. I'm going to try this - thanks for posting the recipe! So glad you enjoyed it, Anonymous! Infusions with spice, tea and/or citrus are a perfect way to vary this. Could you make this with white chocolate? Anonymous, thanks very much for your question! Melt white chocolate with water and lemon juice in bowl over low simmering water bath. Cool. Whip egg whites to soft peak. Whip heavy cream to soft peak. Fold 1/3 of egg whites into the white chocolate mixture to loosen. Fold in remaining egg whites and then fold in cream. Pour into dessert glasses and chill. Oh, thank you. I look forward to your results! The original recipe did not work with white chocolate!However, I used the one you posted for the white chocolate mousse you made for a lemon curd and it worked great! I did make changes as my client could not have eggs so I upped the quantity of chocolate and lemon juice and water by 25% and folded in 2 cups of whipped heavy cream, chilled it and then served with with a medley of berries and a mint leave and shaved dark chocolate. All of the guests were in heaven!! and thank you for your help on this! You are most welcome! So glad your guests enjoyed your dessert. Sounds like you did a beautiful job!